This week we feature, René Thomas, President of Massive Media. Massive is an independent creative advertising agency helping brands craft impactful experiences in digital and analog environments. 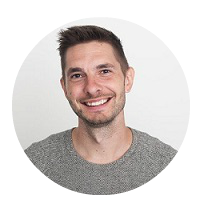 In this interview, you can read more about his work at Massive Media, favorite marketing tools, productivity tips as well as his advice for budding marketers. Your location: 234 Abbott Street, Vancouver BC — right above the best live music venue in town. Your favorite gadget: Fitbit. Human centric data is pretty awesome. Describe an average day at Massive Media?Each day starts with a scrum where we each take a minute to run through what we’re working on, any roadblocks we might have and offer input to what other team members are working on. Aside from that, each day varies depending on what projects and campaigns we’re working on. That’s the beautiful thing about working in a digital agency — no two days or projects are alike! Exercise in the morning! Starting off this habit isn’t fun, but once you establish a routine, working out in the morning goes a long way in allowing you to stay focused and on-task throughout the day. Attack the undesirable tasks first and knock off the simple tasks as they come. I stand by these two rules as they ensure you don’t fall behind. Lean on your team. Foster a culture where tapping in team members for feedback and relief is encouraged. You’ll be healthier, happier, and produce better work as a result. Active InboxThis is an invaluable tool for staying on-top of, and prioritizing your inbox. I couldn’t live without it. FeedlyA simple news aggregator that goes a long way in staying up-to-date on both my and our partners’ industry trends. SlackEach project gets a channel. We save a lot of time leaving comments in PM software and back and forths over email. Tapping into your users’ heads and understanding their reality is likely the most crucial part of a project’s success. At Massive we use a two-pronged approach to collecting customer insights, gathering both qualitative and quantitative data. We try to collect qualitative data in person throughuser testing sessions, focus groups, stakeholder interviews and user interviews when possible. Workshops like Adaptive Path’s Experience Mapping workshop are invaluable! When unable to conduct qualitative research in person, we use tools like Treejack, Usabilityhub, Usertesting.com (to name a few). Quantitative Data is gathered through independent research, like analytics, A/B testing, the usual. In our experience, both qualitative and quantitative need to be conducted to get a complete picture of what the customer’s journey is like. This is the cornerstone of any project. What is your strategy for getting people to your site and then converting them to a customer?Understand your audience and uncover impactful ways to offer them value. I think most folks who’ve been in this space long enough will tell you there are no magical formulas or secret strategies. That said, the processes I’ve found that consistently produce good results are centred around listening and value-finding. A lot of frameworks exist that follow these principles, and we utilize any number of them depending on what a project calls for. Generally speaking, we tend to follow a Design Thinking process, regardless of whether working on an advertising campaign, designing a new brand identity or building an app. Google’s Design Spring Kit is a good place to start if you’d like to learn more about this. It’s a cliché, but fail fast and lean into the negative feedback. Test your assumptions, messaging and creative in the cheapest medium possible. Whether it’s running ad copy by a team member or throwing a preference test up on Usabilityhub — finding and fixing ‘mistakes’ in the brainstorming/research phase costs a fraction of what it does after you’ve launched or in development. More importantly, you’ll see better results across all your campaigns and projects. How do teams at Massive Media have fun at work/ make work fun? OR Describe one fun activity you did recently that energized your team? Put ten + quirky creatives in the same space and just try to stop them from having fun. We try to get together at least once a month socially — whether it be for a hike, BBQ, or even just over drinks and sushi. A couple weeks ago we one first place at a Design Quiz night — see attached photo for proof. Alternative to question 7: How do you make use of your downtime? Any hobbies, out of work interests that rejuvenate you? When not working I’m either fixing my lemon of a motorcycle, reading or volunteering at PeaceGeeks. A big thanks to René for taking the time out to answer these questions! If you haven’t already, we highly recommend that you check out Massive Media.